With the Holidays upon us, Budweiser has been in the news with their recent marketing “Noise” of needing to reach millennials and potential usage declines of the iconic Budweiser Clydesdales in its messaging. The brand has turned back the clock on its packaging and returned to the retro look. In a special release, they have packaged beer and glassware in a wooden crate for the holidays. 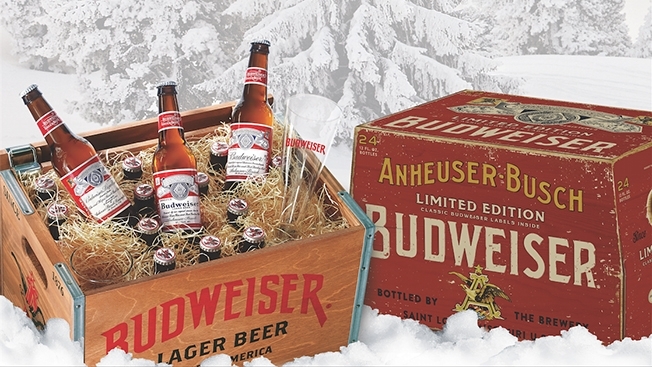 In 2015, Budweiser is said to target more food led event/occasions. With friends celebrating friendships & stories at parties or bars, the extremely popular ride sharing services Uber and Lyft are primed for high demand. To the surprise of some recent users, Budweiser teamed up with Lyft to give passengers the ride home of a life time: On the Budweiser Clydesdale hitch. It is said marketing campaigns these days are the experiences a brand can deliver. The surprised millennials encountered the icon Clydesdales in a relevant way. Icon brands always find a way to reinvent themselves and stay true to their roots. This entry was posted in Activation, Beer, Macro Brews, Marketing and tagged Budweiser, Clydesdale, Ride Sharring. Bookmark the permalink.